What is Saliva? What serological tests are used to detect it? Saliva is a watery substance that is secreted from three salivary glands in the human mouth. It is comprised of mostly water, but also contains electrolytes, mucus, antibacterial compounds, enzymes and epithelial cells. These epithelial cells are a source of DNA for forensic analysis of saliva samples. Saliva is rich in salivary amylase (α-amylase) which is an enzyme utilized for the break-down of starch. Although found abundantly in saliva, salivary amylase can also be found in other bodily fluids including blood, sweat, tears and urine. Therefore, all serological screening tests for saliva are considered presumptive. Common screening tests for saliva include: the Phadebas Press Test, the SalIgAE test, and the Starch Iodine Radial Diffusion Gel. What is the SalIgAE Test? How specific is it and what can cause a false positive result? The SALIgAE® saliva test from Abacus Diagnostics, a colorimetric test, is based upon the presence of salivary amylase, a compound present in high concentrations in human saliva. The mechanism for this test is proprietary due to its patent on the technology. It is a simple colorimetric test with a “positive” result being a color change from a clear fluid to a yellow fluid in the presence of salivary amylase. A “negative” result is indicated by no color change. The test appears to be highly specific to salivary amylase. There is a paucity of research reports on the potential causes or frequency of false positive results. What is the Starch Iodine Radial Diffusion Gel? How specific is it and what can cause a false positive result? 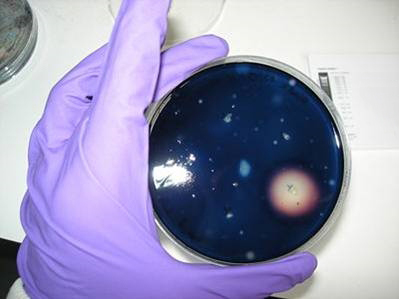 In the radial diffusion test, a petri-dish is prepared containing an agarose solution mixed with starch. Circular wells are cut into the gel, and then samples suspected of containin saliva are transferred into the wells. After a 24-hour incubation period, the gel is stained with an iodine solution which identifies the presence starch by the formation of a dark purple color. Samples that contains amylase are indicated by an unstained ring/halo around the well. The unstained area is created by the diffusion of amylase into the gel and the subsequent break down of the starch in the gel. This is a presumptive test for salivary amylase and is not human specific. False positive results can be caused by the presence of proteins such as albumin and gamma-globulin which are associated with blood and other body fluids.